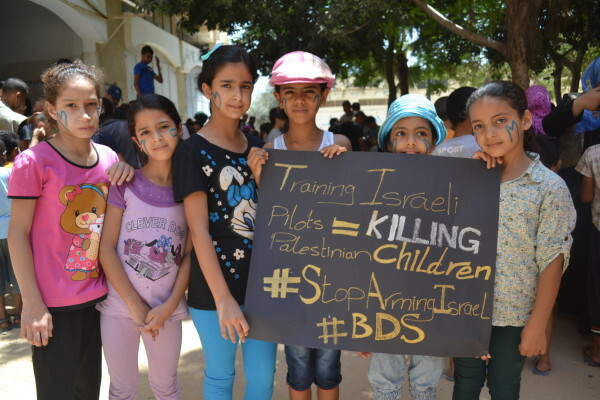 Join the BDS movement and make an impact! Why should I join the boycott of Israel? Check out our timeline to see BDS-related achievements to date. Boycotts and sanctions helped end apartheid in South Africa! There are thousands of consumer goods sold by Israeli companies and international firms that participate in Israel’s human rights violations. Consumer boycotts are most effective when they are targeted, strategic, based on accurate data and have the potential to win wide support. The most impactful consumer boycotts are those that are part of a broader campaign that can have a tangible impact such as pressuring retailers to stop selling a particular product or convincing a company to end complicity in Israel’s international law violations. Boycott targets may differ from country to country, so you might want to contact a BDS related organisation near you to find out what the boycott movement in your country is prioritising. Fruit and vegetables are some of Israel’s biggest exports. They are often grown using stolen Palestinian land and water. Check the label to see if it is marked ‘Product of Israel’. Brands to avoid include Jaffa, Mehadrin, EDOM and Hadiklaim. 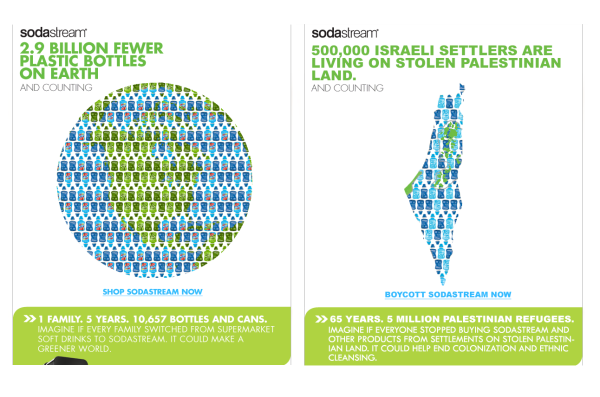 One of Israel’s most visible brands, SodaStream sells home carbonation drink machines and greenwashes Israel’s colonization policies as ‘environmentally friendly’. The company operates in an illegal Israeli settlement in occupied Palestinian territory, in violation of international law. SodaStream plans to open a plant inside Israel close to Rahat, a planned township in the Naqab (Negev) desert, where Palestinian Bedouins are being forcefully transferred against their will. Sodastream, as a beneficiary of this plan, is complicit with this violation of human rights. A number of retailers have stopped selling SodaStream as a result of BDS pressure. Ahava is a cosmetics company that operates in an illegal Israeli settlement that has been boycotted by a number of big retailers as a result of BDS pressure. There is nothing beautiful about Israeli apartheid and occupation! Teva Pharmaceutical Industries is Israel’s largest company by operating income and therefore provides the Israeli government with vast tax revenues. The company also profits from the Israeli policies that create a captive Palestinian market for Israeli medicine. Pharmacists in the UK and elsewhere have begun a boycott of Teva. Where possible, tell your doctor you’d like to use an alternative to Teva medicine! 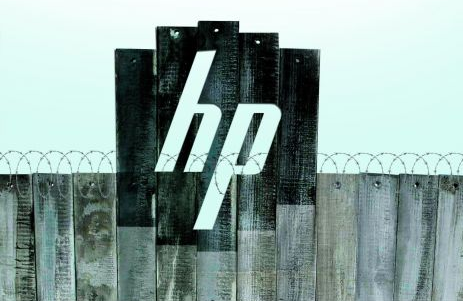 HP runs various IT systems for the Israeli government and military, including the ID system installed at Israeli military checkpoints and for the Israeli navy that enforces the siege on Gaza. That’s why the Presbyterian Church USA and the Quaker Friends Fiduciary Corporation (FFC) have divested from the company. Boycott HP products! 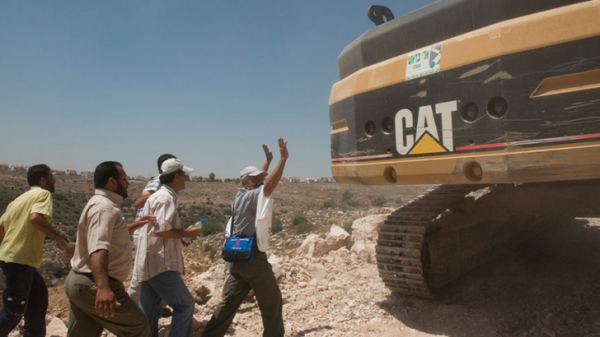 Caterpillar bulldozers are regularly used in the demolition of Palestinian homes and farms and in Israel’s attacks on Gaza. A CAT bulldozer was also used by Israel in killing US peace activist Rachel Corrie in Rafah in 2003. The Presbyterian Church USA, the Quaker Friends Fiduciary Corporation (FFC) and the Church of England have all divested from Caterpillar. Don’t buy Caterpillar clothes and footwear! 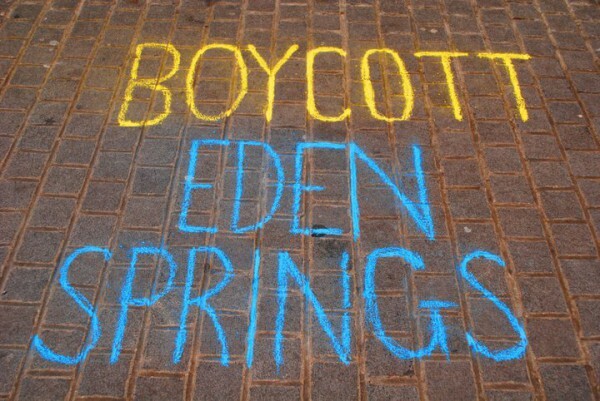 Universities and public authorities across Europe have stopped selling Eden Springs bottled water after campaigners highlighted the fact that the company operates a plant in an illegal Israeli settlement. How should I choose what to boycott and campaign against? Easy to explain: We need to focus our boycott campaigning on those companies and products that are the most clearly and directly involved in Israel’s human rights violations and easiest to explain to a wide number of people. Wide appeal: The ideal campaign target should enable the creation of broad, cross-struggle alliances. For example, the campaign to stop contracts with the Israeli water company Mekorotengages a wide spectrum of environmental and anti-privatization campaigns. Potential for success: A BDS campaign should have a realistic chance of success, beyond simply raising awareness, such as persuading an international company or institution to end support for an Israeli company. Or it could mean pressuring a campaign target to stop contributing to Israeli violations of international law. Intel, the US chip manufacturer, has invested billions in the Israeli economy, making it deeply complicit in funding Israeli impunity. However, Intel is not currently a worldwide BDS target because of its near monopoly status in its sector, making a consumer boycott of the company hard to achieve at present. Well-organised consumer boycotts have proven to be really impactful. However, the BDS movement is also about campaigning alongside others to pressure institutions, unions, and companies to join the boycott and to isolate Israel academically, culturally, economically and militarily. We campaign for divestment from Israel, Israeli banks and corporations, as well as from international companies that participate in Israel’s crimes. The BDS movement pressures public bodies not to award contracts to companies that participate in Israel’s human rights violations. BDS also aims to pressure governments and international organisations to impose sanctions and a military embargo on Israel. BDS campaigns have already persuaded major companies and investment funds to divest from companies that participate in Israeli crimes such as Veolia, G4S, Alstom, Africa-Israel and Elbit Systems. Veolia and G4S have reacted to campaign pressure by saying they will end some aspects of their support for Israel. Check out our list of ideas on how to Get Involved in BDS campaigns or look for a BDS campaign in your local area. Artists such as Coldplay, Snoop Dogg and Elvis Costello have heeded the Palestinian call for a cultural boycott of Israel and refused to play in the country. Stars including Roger Waters (Pink Floyd), Danny Glover and Miriam Margolyes have endorsed the boycott of Israel. Do the barcodes on Israeli products start with 729? Accurate research from credible sources proving direct complicity with Israeli violations of international law is a really important part of BDS campaigns. As in the boycott against apartheid South Africa, the BDS movement calls for a boycott of all Israeli products. For example, we call for a boycott of all Israeli fruit and vegetables, regardless of whether they are grown inside Israel or in an illegal Israeli settlement. However, some of our biggest campaigns are against companies that operate in illegal Israeli settlements in the occupied Palestinian territory. This is because campaigns that target companies that more obviously participate in Israeli violations of international law are more capable of winning wide support and pressuring corporate and government decision makers to take action. We also defer to our partners’ priorities in any given context. This is part of a gradual BDS strategy that builds on our achievements each time we succeed in forcing a company or government to end their support for Israel in some way. As our movement grows, so do our ambitions and ability to achieve results at scale. Targets are regularly reassessed as the BDS movement grows. I’ve heard that Coca-Cola, McDonald’s and Starbucks give a lot of money to Israel? Shouldn’t I boycott these companies? The global nature of today’s economy means that there are thousands of companies that have links with Israel and are complicit to various degrees in Israel’s violations of international law. Effective BDS campaigns are based on accurate research. There is a lot of information online claiming that big companies give money to Israel. Sometimes these rumours turn out to be false. 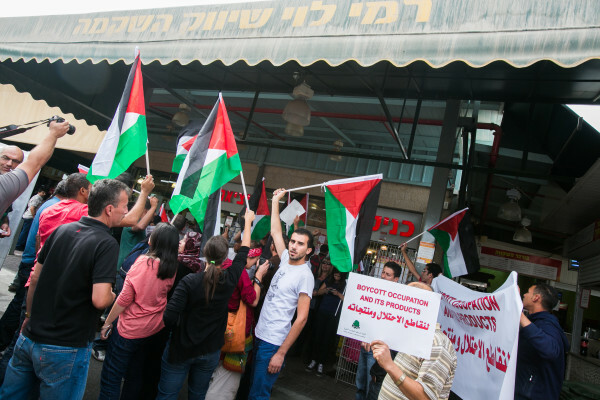 Companies such as Coca Cola and McDonald’s are not priorities for the BDS movement at this stage. We focus on companies that play a clear and direct role in sustaining Israeli violations of international law and that we can have a tangible impact upon. We must remain strategic and think of sustained, long-term impact on Israel’s regime of occupation, settler-colonialism and apartheid. This is the best way that can we contribute to Palestinian freedom, justice and equality. 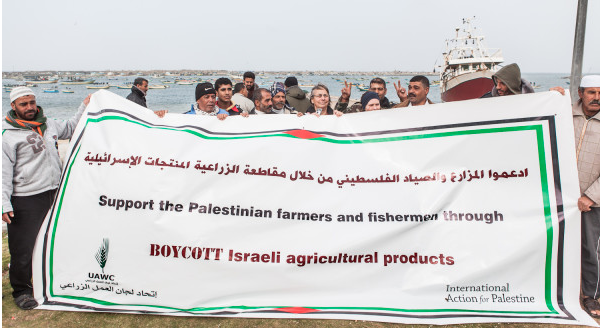 Published by the Palestinian Boycott, Divestment and Sanctions (BDS) National Committee, the broad coalition of Palestinian parties, unions, NGOs and social movements that leads and acts as the Palestinian reference for the international BDS movement against Israel.